SUMPTION TOTALED 473 MILLION POUNDS, THE LARGEST TOTAL EVER REPORTED. THIS CHART APE GIVEN IN TABLE I. 1942 and this will be a strong supporting factor to domestic wool prices. 1941-42 provided, of course, that shipping space is available. in 1940-41 came from South America. took about 80 percent of South American wool exports. and October carried prices close to the highest levels in more than a decade. higher than a year earlier and were the highest since 1928.
week of October 1940 was 88.5 cents a pound. 7,550,675 pounds, according to reports of the Agricultural Marketing Service. relatively greater than for original bag wools. Bidding was most active in the final sales held at Billings, Montana. blood; 90-98 cents for 3/8 blood and 80-88 cents for 1/4 blood. rereipt of award but this provision was open to negotiation. million pounds of. grades 60s or finer. same months last'year, Consumption on a rsoured basis in the first ? and was the largest on record for the industry. end-of-September stocks in recent years. Septerbeibr 27 this year compare with 44 million pounds a year earlier. total supply of wool in this country at the end of Seotcrmbr. larger than a year earlier. Dealers ..........................: 1,114 2,317 2,392.
in the corresponding months of 1940.
first 8 months of 1940.
be stored in the United States. must be filled almost entirely by imports. carpeting and certain other specified articles. 12-cents a pound, clean content, under the Argentine Agre.ne.it. under these classifications is entered in the grease. men's socks. This provision is bound a ainst change in the Agreement. purchases were made by Sweden and Holland for possible export or storage. Argentine clip also retarded forward buying. the season and the carry-over of wool into the 1941-42 season was small. 13 percent in the five seasons 1934-35 through 1938-39.
small part of total exports. All o' r ......................... : 1._ 1. Coninenbtal Europe and Russia ...: 62.4 71. Perc -ntaies based on quantities shown in tables 3 and 4.
l/ Less than .05 percent. after 1922, however, greatly reduced import requirements of apparel wool. increased gr:.tly and reached record levels in the early months of 1941. 1916-17, when the United Kingdom purchased the entire Australian production. Compiled from Commerce and Navigation of the United States. 58 percent from South America. totaled about 66 million pounds. source of United States imports of carpet wool also in the last few years. wools to the United States. of Foreign and Domestic Commerce. / Production is for calendar year. iet imports, year beginning July. Union of So. Africa . China 317 200 IS6 14 3! Compiled from Monthly Sumary of Foreign CoiNrce of the U. S., December issues Part II. Includes wool not finer than 40's. 2Imports for consumption beginning 1934. 4Included with apparel wool finer than 40's. $Included with carpet wool; cannot be oepsarted prior to 1937. Includes apparel wool not finer than 40's. It aI ........ .... .
:1,000 lb. 1,000 lb. 1,000 lb. 1,000 lb. 1,000 lb. 1,000 lb. 1,000 lb. afloat to, all dealers, manufacturers, and topmakors in tho United States. 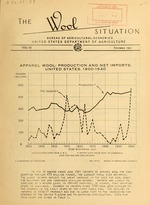 Wool afloat not separately reported until June 1936. Item Year : J n.-Aug. : Aug. : July : ug. ear : Jan.-Sept. : Sept. : Aug. : Sept.
machinery activity from the Bureau of the Census..
/ Sept. imports not yet available. SWeight of greasy, scoured, and skin .wool added together. received from bTulleries and is mostly washed. Before pa,-ment of duty,. Cmoriled from the Foston Commercial Bulletin. jDomestic yarr., first quality, -ure.au of LsIor Statistics. F.r,... Uroir. )during plants, Eurepu of Labor Stt-tistics.